Recently my grandmother passed, and she has been my garden confidant and canning champion the past few years. I don't have anything to can from the garden yet, so I decided to try to can a big batch of Boston baked beans instead. It felt like a simple way to keep her close to my heart. When I work in my garden each year, I will certainly be thinking of her. I got two large bags of Great Northern beans and soaked them overnight. Then I drained them and topped off with fresh water. I boiled them until the skins started to split. I layered them in my two hugest baking pans with chopped onions, green peppers, bacon, and a sauce made from molasses, salt, dry mustard, the water I boiled them in, and brown sugar. I baked them for 3 hours at 325. They had to be processed in the pressure canner for 85 minutes. 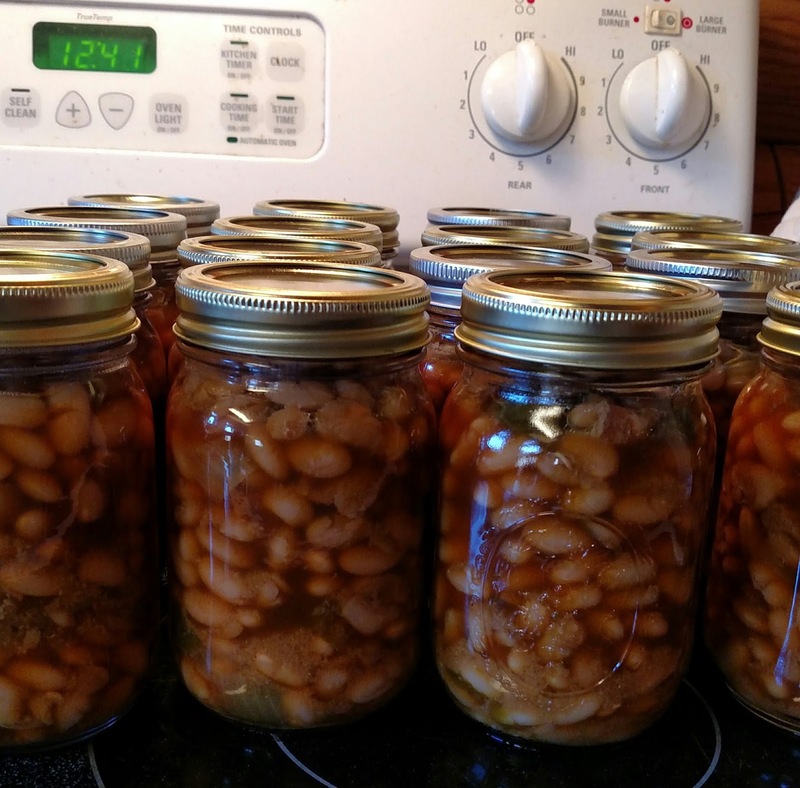 It was a long day to make these beans, but I ended up with 16 pints (plus a couple of pints I left out that we ate for dinner that night), and they have a great flavor. Plus, baked beans are so inexpensive to make! Readers, are there ways you like to honor the memory of your relatives? The boys will love those and the problem may be that you don't have enough! You are honoring your grandmother in a lovely way and carrying on her traditions. I bet those beans smelled good as they were baking. And it will be so nice to open up a pint down the road and have them for a meal. When irises come out this time of year, I think of my great aunt Ida and her garden of irises. She was my paternal grandmothers's sister. What a great way to honor your grandmother. I would love to try your recipe...hoping to get a pressure canner before summer. I won't use the bacon, but the addition of onions and peppers sound great along with the molasses. As far as honoring grandmothers....mine was a quilter. I inherited her thimble. A beautiful treasure to me. I learned to quilt to honor her. Mother was an accomplished seamstress. I think of her and the hours she spent teaching me to sew, every time I sit down at my sewing machine. In his later years, Dad lived several hundred miles away from me. I phoned him twice a week. He ended each call with the words, 'I sure love you, Sis.' Even though my kids and grands live close, I always end each call by telling them I love them. And I think of Dad. Sorry to hear of your loss - 15 years later I still miss my grandmother Elsie. What a lovely way to honor her memory - to carry on the traditions, etc. Which is exactly what I do. My grandmother Elise, or Nana to me, was a great baker of pies, desserts, not to mention her great meals. She cooked regularly for family, and I do the same. She was also a great decorator of the home - another habit I have picked up from her. I love your beans idea!! What a great way to honour your grandmother, and those beans look delicious. I am hoping to get some of our own beans canned this year, so have planted quite a few pole beans. Should we have a good harvest I shall remember your recipe! I am so very sorry, Lisa. It was awful when my grandmother died, I had a really bad time. You are turning your tears into delicious memories, you are so awesome!! I don't think I knew that your beloved grandmother passed away, Lisa. I'm sorry to hear this. Of course, like the others, it's nice to see your memories of her through gardening, and canning. Polushki...they are polish finger dumplings. It's like soul food for us when I make them. The beans sound good. I'm sorry about your grandmother. I do make homemade beef and noodles sometimes, in honor of my grandmother. So sorry for your loss. I hope to start canning with my mom once she gets moved here. We received a pressure cooker for Christmas and we can use it for canning as well. Those sure do sound good. I like baked beans, I get them from the store and then add things like extra onions and hot peppers to them. Yum! No, I don't guess I do anything special, but I do remember my relatives that have gone, and think about them sometimes. Interesting! I have never thought to save our harvest in processed form. So sorry to hear about your grandma. What a wonderful way to honor here and keep her close. Whenever I paint or draw I feel close to my grandma because she was the one who first inspired those creative outlets. Glad they were good. They sound delicious! What a sweet way to honor your grandmother; I'm sure you will be thinking a lot of her when you're in your garden this year. My grandmother used to live in the same house that we do now. I planted a lilac bush in honor of her memory; it was her favorite flower. She also loved the color purple. It's starting to bloom right now. That is great. I should try and make beans in this way. I did a painting where the head of a girl was from a doll I got from my Mom's late cousin that came to all of our family gatherings. In the same painting there was a cuckoo clock for my grandma and grandpa. My grandpa is still alive, but that's from the best time that I remember hanging out with the two of them. This brought back many wonderful memories of my late Aunt.